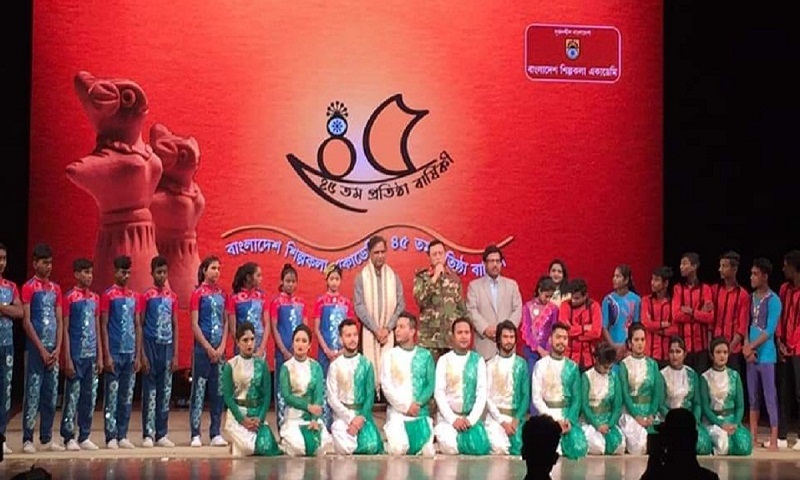 Bangladesh Shilpakala Academy (BSA) celebrated its 45th founding anniversary on Tuesday. Elaborate programmes were organjsed on the academy premises on the occasion. The programmes featured discussion, cultural events and acrobatic show. State Minister for Cultural Affairs KM Khalid was present as the chief guest at the discussion and cultural session while BSA Director General Liaquat Ali Lucky presided over the event. An exhibition, based on the works of all departments and sections of BSA, was held at the National Art Plaza of BSA. Its district branches arranged festivals, programmes and training on various fine and performing arts. Bangladesh Shilpakala Academy is the principal state-sponsored national cultural centre of the country.